Las Vegas is quickly becoming America’s food mecca. Nearly every celebrity chef has set up shop in the city and the dining options are growing exponentially. I recently dined at Tetsu, Chef Masa Takayama’s first teppan concept. Tetsu is an intimate and interactive dining experience that offers guests a taste of fine Japanese grilling (Disclosure: I received complimentary food and drinks via Nokia). Located in Aria Resort and Casino, Tetsu is elegantly decorated with warm colors and modern touches. The high-arching ceilings makes the space feel open an airy while the subtle lighting keeps things intimate. My group was invited into one of the six VIP communal teppan grill tables where we were greeted by Executive Chef, Bonifacio Dela Cruz who shared his philosophy on cooking. “I like to cook in a traditional Asian style with the freshest ingredients available,” he said. Chef Dela Cruz was a quiet, reserved man but I could tell that he was serious about cooking. I couldn’t wait to sample his dishes. 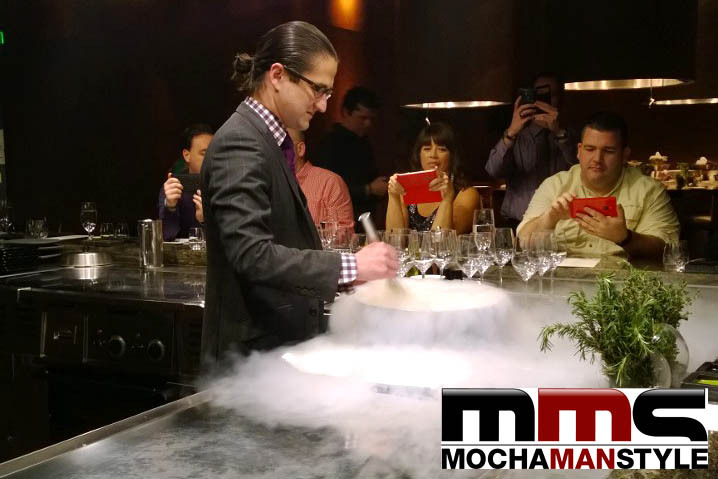 Property Mixologist, Craig Schoettler, got us started with a liquid nitrogen cocktail. While he was preparing the drink, I felt like I was watching a magic show. I fully expected him to saw a woman in half for his grand finale. The drink was crisp and refreshing – a great beginning to our meal. Chef Dela Cruz stepped back into the spotlight to prepare a delicious 5-course meal complete with sake pairings. Watching the chef cook was a humbling experience. While he didn’t display the flair and showmanship that I’ve seen at other teppan restaurants, he did impress me with his culinary skills. He could do things with two knives that I couldn’t even accomplish with a full set of kitchen utensils. Although Chef De la Cruz didn’t set things on fire or send food flying through the air, he stayed true to his initial promise and prepared a meal that was fresh, masterfully prepared, and delicious. 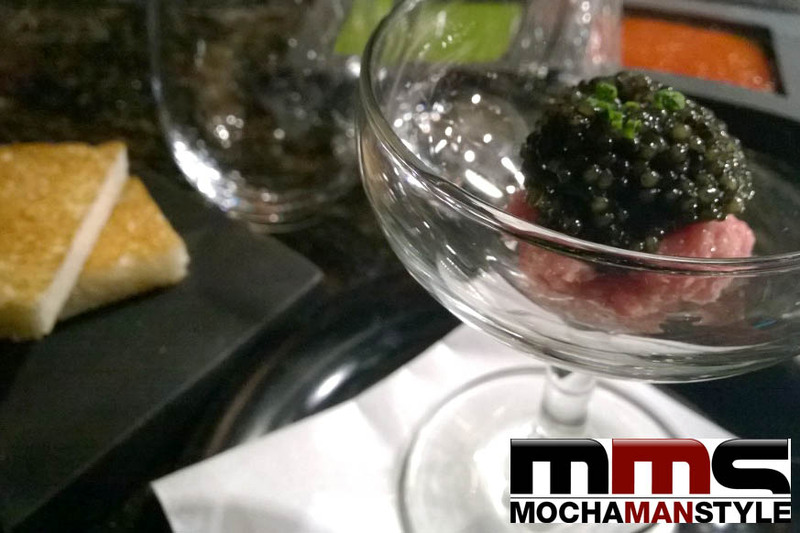 Our appetizer course was a salad with Beets, Wasabi Cress and Chikuwa with Wasabi Dressing and Toro Tartare Caviar. I don’t usually like beets, but the wasabi dressing made them more palatable to me. The caviar simply melted in my mouth. Next we had scallops and Jalapeño Calamari. 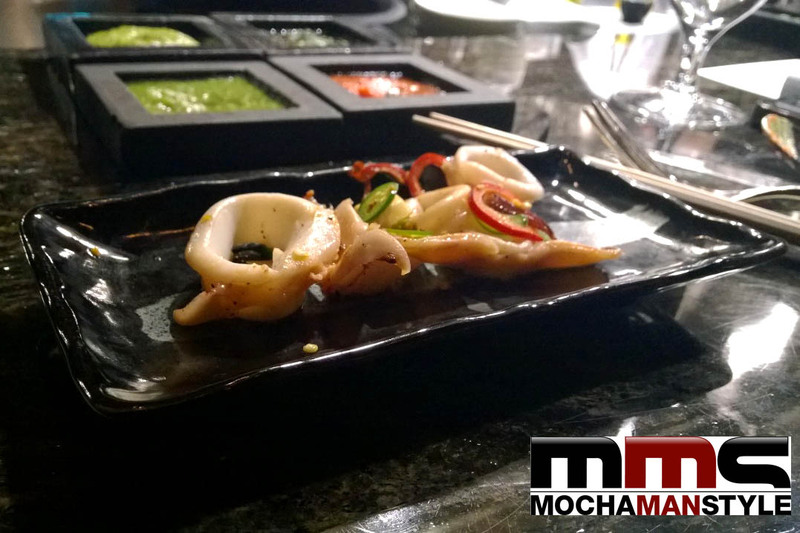 The scallops were okay, but I loved the calamari. It was tender and flavorful. The jalapeños added just the right amount of kick. The stars of our meal were the entrees. 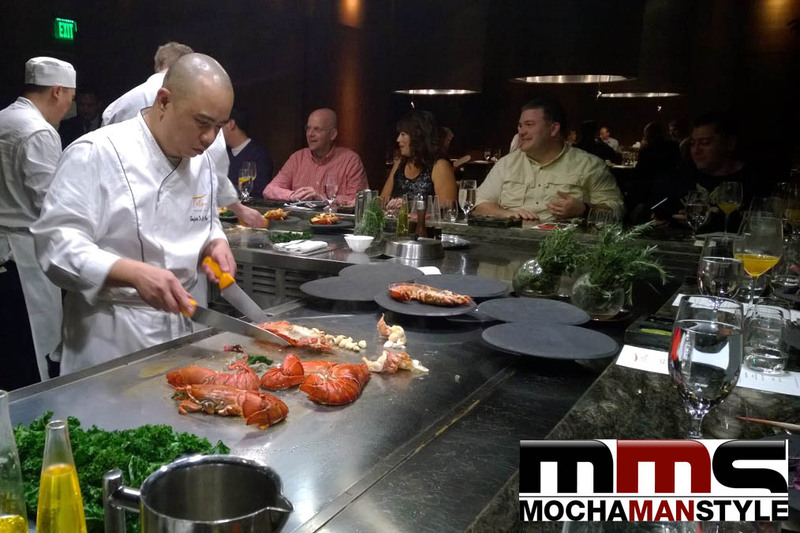 Chef Dela Cruz prepared a surf and turf selection – Rib Eye Australian Wagyu and Live Lobster with Pineapple Butter. 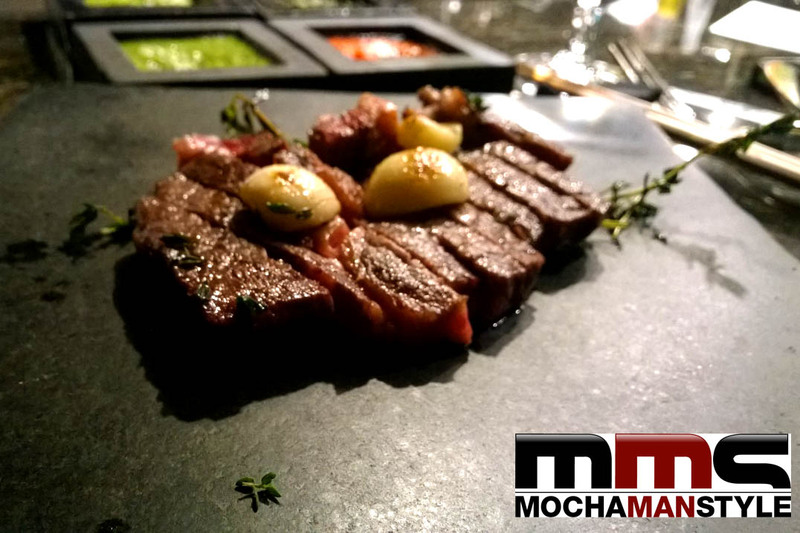 The beef was perfectly cooked – tender, juicy, and succulent. 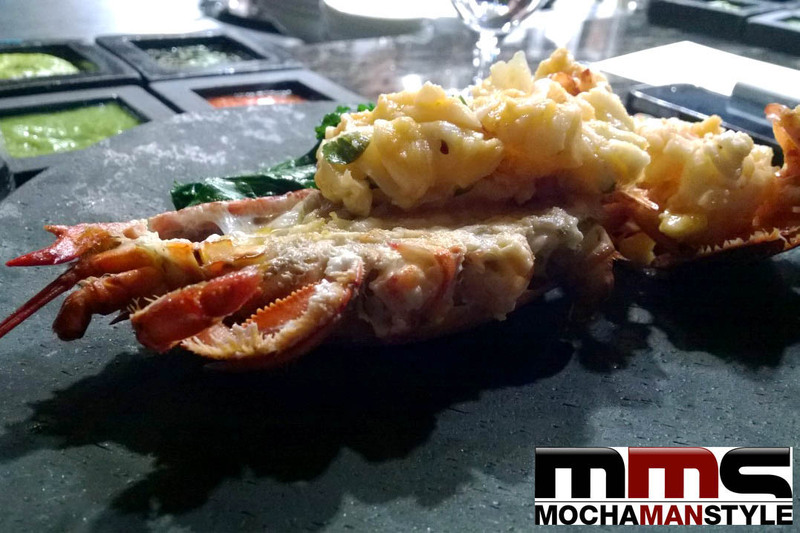 The pineapple butter enhanced the lobster’s sweetness and provided the perfect contrast to the steak. Chef Dela Cruz followed the entree course with freshly grilled asparagus, shiitake Mushrooms and vegetable fried Rice Finally. 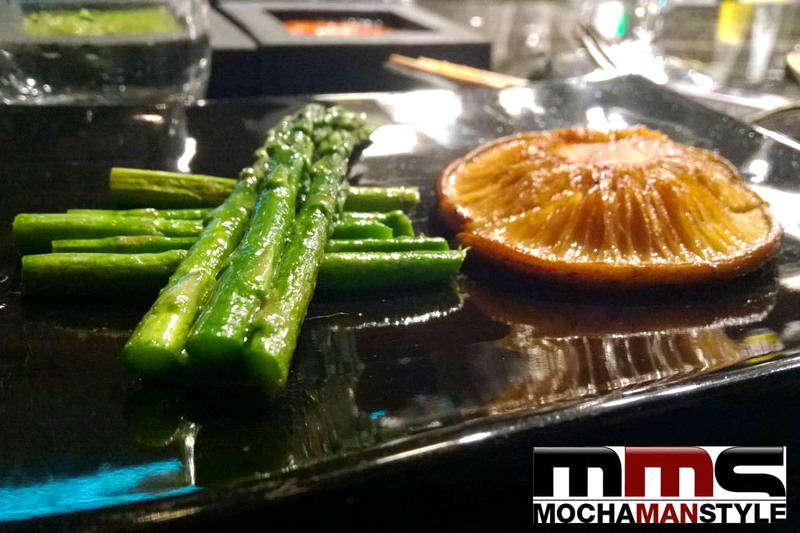 Although I enjoyed the vegetables, I was intrigued by the rice – a combination of black and red grains. It was crunchy and nutty with added richness from the wagyu fat. We completed the meal with a light Yuzu Sorbet. As we filed out of the restaurant, Chef Dela Cruz thanked my group for allowing him to cook for us. “I hope you liked your dinner,” he said. I shook his hand and assured him that the meal was spectacular. He smiled and handed me his business card. “Please come back when you’re in Vegas,” he said. I patted him on the back and promised to dine at Tetsu on my next Vegas trip.